8 Myanmar (Burma) Travel Myths: The Guidebooks are Outdated! Don’t be scared off by the outdated notion of impossible travel barriers in Myanmar. Myanmar is rolling out the red carpet for businessmen and tourists alike. My guidebook printed in December 2011 is impossibly out of date. The CNN travel documentary that aired in May 2013 is factually incorrect about money changers. Here is a summary of the biggest contradictions. Visa on Arrival is technically not possible for non-business, or non-Chinese-package tourists. But if you go through a good agent, you can arrange to fly to Myanmar without a visa in hand and the process couldn’t be simpler. Just send a picture of your passport and an itinerary. Mine was processed 3 days in advance. Not a single package tour or government hotel required. There are tons. Everywhere. 3 in the airport alone. Every shopping mall in Yangon has several. They have them in Bagan. They take MasterCard, Visa, Plus. The banking sector has exploded with the evaporated embargo. 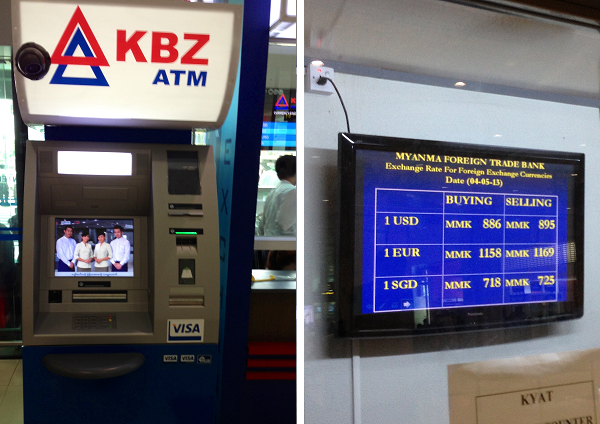 As of July 2013, KBZ bank alone has over 40 shiny new machines in Yangon and another 20 scattered across the country, including Bagan. It’s a good idea to let your bank know that you’ll be in Myanmar so you have no issues. Not true. The currency black market is gone. There is a line of money changers, each offering tighter spreads then I see at US airports. today, they buy at 888, sell at 897. That turns out to be 5% better than you get from ATMs. The rates at airports are slightly better than in the cities, so plan ahead. Top hotels take them, many midrange ones through Paypal or similar. If you have to use Amex, Hotel Travel can book hotels and provide vouchers. I’m blown away by their customer service, and I’m a difficult customer. Myth 5: You need to bring a stack of brand new US $100 bills or you’re sleeping on the street. There is still residual desire for crisp, new US bills, since the Chinese bring piles of them, but they take almost anything that’s newer, clean and not ripped. They no longer require huge bills, and take all denominations, although old preferences linger. Currency exchange is not as critical with ATMs on every block now. Double the prices and then some. In late 2012, the government mandated the doubling of many travel services to manhandle the fragile free market, and many places are not happy about it. Just double the prices in the Lonely Planet and then add any peak season premiums. Yeah, it does get up to 40 degrees C (104F) briefly during the day, but it doesn’t feel even close to that hot. The humidity is low in the tourist triangle and it’s comfortable if you’re not exerting yourself. Bring lots of water and you’ll do fine. Coming from Singapore, this feels like paradise. Yeah, many are newly paved due to aid money, but they seem to be leveled with shovels and hand trowels. Prepare yourself for extremely bumpy rides. This is so helpful, thank you! Burma has been high on my list for ages, but always with a touch of concern about the things you touched on here. Good to know that it sounds a lot easier than I expected! It’s a shame that sanctioned countries suffer from so much misinformation even in the internet age, we heard so many things about Cuba that turned out to be completely false! Oh, another thing, we are going to Myanmar,Cambodia, Vietnam, Thailand and Laos not going really off the beaten track, do i need to take Malaria tablets? Maria, that sounds like an amazing trip! One of my favorite regions to travel. Your travel doctor is the best person to answer that question. Malaria strains and drug-resistance can vary greatly by location and the type of travel and current outbreaks can affect your risk substantially. cdc.gov is a great information source for travel health, but your doctor can help with risks that are more specific to your situation. Thanks very much for your help, with that in mind I think I might book all of our accommodation for Burma before setting off. Hi, we are traveling to Myanmar in sept/early oct 2014, i have read there is a huge shortage of hotels, what is the best way to play it? Book in advance through someone like booking.com which seem quite expensive but what are the alternatives? Things are getting much more expensive, the government has been mandating rate increases. I would consider booking ahead, at the very least least for the first night. I am planing a trip to Myanmar (actually bought the ticket already) and now I am suffering immensely since I find so much different info on how to get the visa and if it is possible or not. Could you please help me understand. With your company myanmarvisa.com was is completely simple, I should not worry. Because I even contacted a gov pag and they say that is a scam.. I am very confused. Hi Sofia, Myanmarvisa.com is not my company and they do not pay me. There are a lot of shady visa companies that have popped-up in Myanmar as a result of the tourism boom. Many are unreliable or even worse, stall the process until the last minute and then tell you that you have to buy an expensive government hotel package from them in order to process your visa. That is why I recommend this company for independant travelers, they are typically easy, honest and quick and I have never heard a complaint. I hope you enjoy Myanmar, it is an amazing place. Dear Brad, I am sorry my question sounded wrong… I didn’t mean it was your company, but the one you mentioned. 🙂 I am just in a mess trying to sort out this since with so many new info everything makes me doubt and worry I will be at the airport and not able to get in. 🙂 Thank so much. The official page says that tourists need a visa or have an approval letter and your visa waiting at the airport. Business visas are different. The government is hoping to do eVisas for tourists in the future promising a 3-day turnaround, but that system is in testing. If they are telling you to show up, it sounds risky, but I’d love to hear how that works so I can make updates to this post. Wish I had read this before our trip to Myanmar in March! We arrived with the crisp hundred dollar bills that were totally unnecessary and worried about the lack of ATMs but found plenty. The only thing I have to disagree with is that the heat is bearable. Walking around Shwe Dagon in 40+ degree heat nearly finished me off! Thanks for stopping by, Toni. I did the same thing with money! I watched the CNN show, and went there with crisp $100 bills and everyone told me they haven’t had the seedy black market money changers for years. It is very dry there, it definitely doesn’t feel 40, and outside of the mid-day, it is pretty pleasant. Thank you for this update of Burma! Thank you for your response. I did receive a scanned letter emailed to me in Burmese. Nothing I can even decipher. Why I ask if it was an issue boarding the flight. Wondering if the airline representative questioned it and needed to explain. Myanmarvisa.com gives me the impression its a letter ALL incoming airline to Myanmar will accept. Appreciate any thoughts. The reason airlines check documentation is because if you get deported (which I have a few times), it’s usually the airline’s responsibility to cover the return flight, sometimes at the expense of a paid, ticketed passenger. That’s not easy to explain to a paying passenger. Hi: Great article. Using the visa service, was there an issue boarding your flight without a visa stamped onto it? How was it explained to the airline? They give you a letter saying your visa is approved and waiting for you. Thank you Brad for the information! I used the site you recommended for my visa, and purchased their ‘Normal’ service which is 10 business days (I fly Dec 6th). It did not indicate that someone would meet me, however it did direct me to the visa offices upon arrival, so fingers crossed! Thank you Brad, this is very helpful. I am planning to travel to Myanmar from Chiang Mai, by bus – can you help with any tips? I am planning on making my application for a tourist visa to the Myanmar London Embassy prior leaving the UK. Do you think I will encounter any issues crossing the borders and getting to the Bagan area? Jane. Wow, I don’t have any experience entering Burma by bus. Almost everyone flies into Yangon. Sounds like an awesome trip. I know the government restrict tourism to many areas outside of the “tourist triangle” of Yangon-Mandalay-Bagan, so I would look into that. Interesting list. It’s amazing how fast things are changing there! In summer 2012, there were no ATMs that would accept foreign cards. Now, you have access to plenty! It will continue to change at breakneck speed, I suppose. Any word on the price of SIM cards? Have they come down in price at all? There have been rumors of cheap SIM cards all year, but I haven’t ever spoken with someone who has actually purchased one. Stories of delays and lack of supply abound. As far as I can tell, it’s a day-to-day thing. I hope they get it sorted soon! Hi Brad! Excellent article. Thank you again for sharing it with me over at my blog. I feel a lot less stressed out about money than I did before. I was worrying about not finding ATMs and having to carry around hundreds of dollars to trade in on the street. Unfortunately I was already expecting huge prices hikes from the LP listings. But overall I’m so excited for this trip! Thanks for straitening out some of my misconceptions. 🙂 Thanks again!!! Just tried the “Visa on Arrival” service you provided as I was in a rush too: ordered their urgent express service and just got confirmation the visa will be ready today: 3 days all in all. Wonderful and thanks for the tip! That’s great. I’m glad everything worked out for you in such short order. Hope your trip there is amazing! Such an inspiring travel destination! Can you share who you both used to get this 3-day service ? I used this visa online service (same as link above). I don’t think they guarantee it in 3 days but mine was approved that fast. I would say make sure you get them a picture of your passport and your planned daily itinerary as soon as you can. I’ve heard really good feedback from other travelers on this agency too. Hi Dan, I haven’t heard a bad thing from anyone I’ve talked to, but this is Southeast Asia and I wouldn’t expect any agency to be Six Sigma quality level. I did talk to a dozen or so other travelers out there who used different services, and many said their agents “forced” them into buying expensive hotel package deals to get their visa (some saying only government hotels were allowed), so I wanted to let everyone know that this one seems to be very reputable. If you find anything different, I’d be interested in knowing. I’m not biased, I just hate to see travelers get scammed. Brad you did not get a visa on arrival. You got a pre-arranged visa though a travel agent. This option has been available for many years. Visa on arrival means you can fly into a county and walk up to a desk and purchase a visa, no pre-arrangements necessary. For very limited numbers of people (those arriving on Myanmar Airway International from Cambodia and China) a visa on arrival is possible. You are probably correct that “visa on arrival” has a specific legal definition. The agents all call it visa on arrival, probably technically inaccurately. As I look at my documents, they gave me a visa approval letter and processed the visa at the airport on arrival. Point being, the process can be very simple if you use the right agent. With as little as a few days notice, you can arrange to show up in Myanmar without a visa in hand. No sending your passport off way beforehand. The Burmese embassy only lists a business visa on arrival or the long way. Many travelers will prefer to use this method.